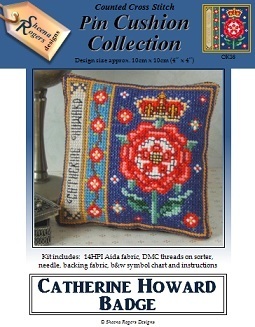 This pincushion design features the Badge of Catherine Howard, the fifth wife of King Henry VIII (and cousin to his second wife, Anne Boleyn, with whom she shared the same fate of being beheaded). The emblem shows a crowned red and white rose without a thorn, representing grace, beauty, love and faith. The design also includes a border of Tudor roses set against a deep Turquoise background, with Catherine's name down the left hand edge, all framed with rich gold and sapphire blue threads.